Aaron provides the voices for Uta in Tokyo Ghoul, Kamui Woods in My Hero Academia, Klaus Lunettes in Black Clover, Max Galactica in Ace Attorney, Grimsby Keane in Black Butler, Bobbin in One Piece, Samuel in Fairy Tail, Howard Link in D. Gray-man, Yoshikazu Aihara in Starblazers 2199, Urie Sogami in Dance With Devils, and Hit in the Dragon Ball Xenoverse 2 video game. Nominated for 2014 Breakthrough Voice Actor of the Year by Behind The Voice Actors, Aaron Roberts scored his first big role as Sunny in Toriko: Gourmet Hunter. Having provided voices for over 200 anime series, he’s been featured in such roles as Saitaisai in Saiyuki Reload Blast, Wilhelm Ehrenberg in Dies Irae, Mino in Sakura Quest, Michael the Archangel in High School DxD, Hideki Tama in Evangelion 3.0, Lacus Welt in Seraph of the End, Natsuhiko Koyama in Assassination Classroom, Cody Balfour in Gangsta., and Mamoru in Kamisama Kiss. You may have also heard him in Borderlands: The Pre-Sequel, Smite, Paladins, Attack On Titan, Dragon Ball Z: Battle of Gods, Code: Breaker, Daimadaler: Prince vs. Penguin Empire, Blood Blockade Battlefront, Divine Gate, Eureka Seven AO, Ghost in The Shell: The New Movie, Haganai, Maken-Ki! Battling Venus 2, Mitchiko & Hatchin, Ninja Slayer, No-Rin, Nobunagun, Noragami Aragoto, Tokyo ESP, Unbreakable Machine-Doll, First Love Monster, ACCA: 13-Territory Inspection Dept., All Out! !, and Drifters. 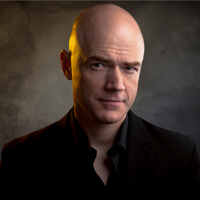 Since receiving his BFA in Theatre from Southern Methodist University, Aaron has been a celebrated actor for the stage and screen in the Dallas/Fort Worth area, and working in all areas of production for almost 17 years.